Yesterday’s class was originally planned to be an Arduino demo of analogRead() and Serial.print(), using either a pressure sensor or a phototransistor, but the class ended up going in a totally different direction. At the beginning of class, I passed around a cheap vernier caliper and showed students how to measure the disposable cuvettes to 0.05mm precision. This was part of my continuing effort to expose students to simple tools that they should have seen in high school, but for the most part have not. I started the class by collecting the proposals for design projects. Since these were group efforts, there were only three proposals: a centrifuge, an incubator, and a PCR thermal cycler. I’ve not read the proposals yet (I’m still under the weather, and ended up falling asleep last night right after dinner, and only waking up this morning barely in time to get to the department research seminar at noon), but I did read the titles in class, and started talking about what computer aspects there might be for each project. The centrifuge is mainly a mechanical design, but a non-contact sensor (probably optical) for measuring the rotor speed would be useful—one might even want to include a motor speed control, but that depends on what they use for a motor. The other two designs both depend on regulating a temperature. Important parameters include how tightly controlled the temperature has to be and how fast you have to move from one temperature to another. An incubator generally needs to have a fairly fixed temperature, and only needs to respond to slow heat loss, except when the incubator is opened. A PCR machine has to switch rapidly between three temperatures, generally around 95° C, 50° C, and 75° C.
So we ended up talking about thermal control. First I described the basic idea of having a “set point” and of simple on-off heater control, with high threshold and a low threshold. We talked about temperature sensors, including the old-fashioned bimetal-strip thermostats, thermistors, thermocouples, and RTD sensors. I talked a little about how to choose among the different types (thermocouples for high temperature, RTD for high precision, thermistors for low cost and ease of interfacing). I also mentioned semiconductor temperature sensors, which are used in a lot of integrated circuits (like CPUs and GPUs on their laptops), but are not very good for general temperature measurement. We focused on thermistors as the simplest to use with the Arduino, and I showed them a data sheet for the NTCLE413E2103F520L thermistor we use in the Applied Circuits lab. This lead to a discussion of how the thermistor resistance varies with temperature, and I showed them the Wikipedia page on thermistors, with its discussion of the Steinhart-Hart equation and the “B” parameterization of the formula. I also explained what the B25/85 specification on the data sheet meant (measuring resistance at only 25° C and 85° C, and solving for B). I then tried to get the class to come up with a circuit to convert resistance variation into voltage variation, but they were stumped. So I showed them a voltage divider and had them work out as a class what the output voltage was using just Ohms law. They were then able to see that replacing one resistor with a thermistor would allow them to see a voltage variation as a function of temperature. I told them about the first homework in the Applied Circuits course (figuring out the optimal value for the fixed resistor, to get the maximum change in voltage with temperature at a particular operating temperature), but did not assign the problem. Not everyone in the class has had calculus yet, and the problem really does require being able to differentiate and use the chain rule. Turn in a printout of your program. This program is simple enough that I don’t need evidence of it working—for other class you may be asked to turn in the source code electronically, so that the graders can test the program, or provide input-output pairs that show evidence that the program is working correctly. Read analog inputs from A0 through A5 and report the values. Write a little control program that turns on the on-board LED (pin 13) when some combination of conditions is true and off when the conditions are false. At the end of class, I had everyone use my wire strippers to cut and strip a few small pieces of wire, so that they could do the hardware portion of the Arduino programming. The astute reader of this blog may notice that there was no “eighth day of freshman design seminar” post. I was sick last Wednesday and unable to attend class, so I had the group tutor (a senior in bioengineering) take the class and have them discuss possible projects to take on. I asked them to turn in proposals yesterday, but forgot to collect them—I’ll collect them tomorrow. We’re about halfway through the course, so it is time for students to start on their projects. I returned two homeworks yesterday: the colorimeter design and the RGB LED resistor sizing. The colorimeter designs were not very good, lacking necessary details, but were somewhat better than previous spectrometer attempts. I think I’ll try reversing the order of those assignments in future, as the colorimeter is a simpler device. The biggest problem with the designs is that most of them were pieced together from web pages, with no citations. Two of them were blatantly copied from Science Buddies, which has a decent design, but the students did not cite the source. I yelled “Cite your sources!” at the class, and explained that I could have flunked several of them out for plagiarism, and that in an upper-division course I would have. I hope they get the message, so that they don’t fail out later on. I decided not to prosecute academic integrity cases in this 2-unit, optional course, though I am making the science-buddy copyists redo the assignment. I then explained to students the mistake I had made in the photodiode explanations (see Lying to my students) and corrected the understanding of the “open-circuit voltage” spec from the photodiode datasheets. I think that the students are a little more comfortable about finding things on datasheets now—I hope that lasts for them. If a battery is used in a schematic, both ends need to be connected. 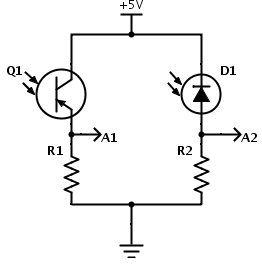 Other options are to use +5v and Gnd port symbols, or a +5V DC voltage source symbol. The LED diode must be forward biased (with a large current flow), and the triangular shape of the diode symbol shows which way conventional current flows. The voltage needed for determining the resistance is the voltage across the resistor, not the voltage across the diode, so it is 5v–VF, not VF. I think I managed to get these points across—I relied fairly heavily on asking the students to do each step, so I’m pretty sure that at least half the class can now size a resistor for an LED. Finally we could get to some new material. I wanted to show them how to program an Arduino, so we built up the standard blinking-LED first example for an Arduino. To make it a little more interesting, I started with a true statement—I did not know whether the LED on pin 13 was hooked up with the anode or the cathode connected to pin 13. We looked at the two possible circuits and how they would behave differently when the pin was high and when it was low. I then explained “void setup()”, “void loop()”, and “pinMode(13,OUTPUT);”. I had the students come up with the body of loop, feeding them the important constructs (digitalWrite and delay) only once they had expressed the action they wanted. We ended up with a loop that help pin 13 high for a second and low for ¼ second. After I typed in the program we had written, I showed them how to select the appropriate board type and download it to the Arduino. The light blinked, and the students were able to figure out from the pattern of on and off that the LED was connected between pin 13 and GND (with a series resistor), with the anode towards pin 13. I ran out of time and material at about the same time (a first for this quarter), and assigned the students to read about Arduino programming from the Arduino reference website, with particular attention to “if”, “while”, “pinMode”, “digitalWrite”, “digitalRead”, “analogRead”, and the timer functions. I expect to go over some analogRead stuff in class tomorrow, and assign a small programming assignment over the weekend, probably using “Serial”. Today we continued looking at photodiodes, phototransistors, and LEDs, in the context of the colorimeter I had asked them to design. I think that next year I may go to the colorimeter first, and then to the more complex photospectrometer. Since the students weren’t familiar with spectrometry, starting with it was of no help, and all the other concepts (absorbance, irradiance, linearity of phototransistors, …) are more than enough to start with. I started the class by collecting the work I had asked them to do on fleshing out the design of the colorimeter, which I have not read yet. I’ll have to grade their colorimeter designs before Wednesday, but I hope we can start learning some Arduino programming by then (probably just setup, loop, analogRead, Serial.print, and delay), rather than going over the homework. After reading what they turned in for photospectrometer and photodiode assignment, I’m not setting my expectations very high for the colorimeters. I think (hope?) that the students are getting something out of the class, if not quite as quickly as I would like. I guess it takes some time for them to turn around habits of a lifetime and start generating new answers and new questions to answer, rather than just coughing back what the teacher said. Simple circuits for measuring light with an Arduino. Update 2014 Feb 6: Q1 is intended to be an NPN phototransistor, not PNP as shown here! For Monday, 2014 Jan 27, as individuals (not groups), find a data sheet for the phototransistor WP3DP3BT. Also, select a cheap photodiode that is available in the same size and shape of package as the WP3DP3BT phototransistor and look up its data sheet.For the photodiode and the phototransistor, report the dark current, the voltage drop across the device (that would be collector-emitter saturation voltage for a phototransistor and the open-circuit voltage for a photodiode), and the sensitivity (current at 1mW/cm2 at λ=940nm, which is the wavelength where silicon photodiodes and phototransistors are most sensitive).Find a plot of the spectral sensitivity of a silicon photodiode or phototransistor (it need not be from the data sheets you found—all the silicon photodiodes and phototransistors have similar properties, unless the packaging they are in filters the light). In class on Monday, we’ll try building this circuit and seeing how it works with the Arduino Data Logger. No one computed R2 correctly. It didn’t bother me (much) that no one knew how to do it, but it did bother me that no one asked for help. I tried to impress on them that asking for explanation is not a sign of weakness, and that it should not be their goal to hide from view when they are confused about something. I don’t know whether this rant got through to them, but maybe if they hear it enough they’ll start asking questions in class or on the e-mail list. Only one person cited a source for the plot of spectral sensitivity for silicon photodiodes, and that more by accident than by design (the URL was printed by the browser). I explained the notion of plagiarism to them, how it was the most serious of academic sins, and how other engineering faculty (and me in other courses) might fail them for the course if they continued to claim other people’s work as their own (which is what an uncited figure is). I told them that they had to get very comfortable with the metric prefixes (only femto, pico, nano, micro, milli, kilo, mega, giga—they mostly won’t have much use for the smaller and larger ones) and their single-letter abbreviations. This is clearly something they need to work on, as one of the common problems in the homework was off-by-a-factor-of-1000 errors, as students changed µW to mW without scaling the numbers. I also impressed on them the importance of typing part numbers accurately—several had mistyped the part numbers for the photodiode they were specifying, and it took me a little detective work to figure out what they had really meant. Some had not provided part numbers at all, and I could not check whether their numbers were right (those students still got the computations wrong). Only three students found photodiodes that matched the specs: “a cheap photodiode that is available in the same size and shape of package as the WP3DP3BT phototransistor ” and that was sensitive to visible light. That meant finding a 3mm diameter, through-hole package. Several students found photodiodes in black packages that block visible light, which was not useful for this application. I explained why such parts exist (listening to IR emitters like in remote controls, without being swamped by ordinary light). Many students, having found photodiodes, could not accurately specify the sensitivity of the photodiode. Most just reported a current, without specifying the irradiance that caused that current. We went over the notion of linearity and that what we were interested in was the slope of the line, and that units were µA/(mW/cm^2). I mentioned that some spec sheets specified responsivity in A/W, but that had to be divided by the sensor area to get the more useful unit. I then had them compute the current at the specified maximum irradiance and the resistance that would be needed to get that current with 5v across the resistor. It took them a very long time (algebra skills are much lower than I would have expected for college freshmen—I have more sympathy now for the teachers of freshman physics), but they did eventually get the right answers for both the current and the resistance. I spent a fair amount of time letting students know that units were their friends, and that they should carry the units throughout the computation. I don’t know if the message got through, but I hope for their sakes that it will eventually. Finally we could get to some new material. I asked them about monochromatic light sources for the colorimeter. Some thought of LEDs, but one student mentioned that he had seen incandescent bulbs as much cheaper than LEDs. It took me a second to figure out where this confusion came from—at the power levels used for room lighting, incandescents are indeed cheap and LEDs expensive. But we don’t need 5–20W of power—we’re not trying to cook what is in the cuvette. I pointed out that the maximum light level expected for the phototransistor was only 20mW/cm^2, so we needed only mW of power from the light, and at that light level, LEDs were much cheaper than incandescent bulbs. I showed them the data sheet for a red LED, and explained some of the concepts. One concept was the difference between peak and dominant wavelength—the peak is where the light has the highest intensity, and the dominant is where it shifts to when multiplied by human visual sensitivity. I also explained what the “spectral line half bandwidth” was, though I did not go into the difference between half amplitude and half power—it was not important at the moment. I then went over the symbol for a diode, how I remember that electrons move from the cathode to the anode (bring up vacuum tubes and cathode rays), and showing them a rough sketch of a diode current-vs-voltage curve. I showed them where various parameters were on the data sheet, though the particular LED data sheet I was using did not include the threshold voltage, just the forward voltage at high current. The students brought up the notion of having multiple LEDs to get multiple colors, so I introduced them to RGB LEDs, showing both the common-anode and common-cathode circuits. They figured out, with a lot of prompting, which way round power had to be connected (the mnemonic device I used was that producing light required power, and power is voltage times current, so there had to be current flowing through the diode). It doesn’t help that photodiodes are used backwards—the photodiode is reverse biased, and current flows only when light produces electron-hole pairs at the back-biased junction. I carefully did not talk about that while we were looking at the LEDs, as I’m sure it would have confused them. For Wed 2014 Feb 5, find a through-hole (not surface mount) RGB LED that is common-cathode, and design a circuit to power it from a +5V power supply. Make each color be as bright as possible without exceeding maximum current (you can leave a safety margin of up to 25%). Explain your design and how you sized the resistors for it. I recommend using Digi-key’s search feature (looking for RGB LED) to see what parameters are usually most important to designers. I recommend using Digi-key’s free web tool SchemeIt for drawing a circuit diagram. They don’t have an RGB LED symbol, but you can make one out of 3 LED symbols (I’d use variant 1 for that). Look at data sheets together. Get class consensus on resistor values from homework due today. Demo the Arduino Data Logger with the phototransistor and photodiode. Discuss next homework (designing a colorimeter). Start talking about Arduino programming. College homework should be typed. Professors expect it, even if they never say so. The one exception is math homework, and I recommend to students that they learn LaTeX and typeset even their math. Homework should always be stapled, not loose sheets, which get separated and lost. Hand-drawn pictures are ok for this class (and many other classes), but I strongly recommend learning to use a drawing tool. Adobe Illustrator is a popular one for those who have money, but Inkscape is an adequate tool for 2D diagrams and is free, though its user interface is rather clunky. For more professional engineering drawings, I believe that AutoCAD has a free (or very low-cost) version for students. Sketchup and Blender are popular free tools for 3D modeling. For schematic capture, I now use DigiKey’s SchemeIt, which I demoed briefly for the students (after having some trouble with the wireless connection in the room—I’ll have to check to see whether there is a live DHCP port by the projector cable in the room). Most students added little to what we did in class. I pointed out that K–12 teachers mainly wanted them to spit back what they had been told, but that college professors were usually looking for added value—stuff from reading outside class or from original design. I pointed out the importance of vocabulary (“diffraction” vs. “refraction”, “focus” vs. “collimate”) and of getting the right physical phenomena (Bragg’s Law for diffraction gratings, Snell’s Law and optical dispersion for prisms). I told them to read the Wikipedia article on optical dispersion, so that they could understand the complexity of determining the wavelength-to-refraction-angle transformation, which is highly dependent on the material the prism is made of. I also suggested that just dumping factoids (like the Bragg’s Law formula) on the paper without explaining the connection to the design didn’t really buy them much. I pointed out the difficult design problem I had given them (300nm–700nm) with a diffraction grating would result in the second diffraction of 350nm at the same location as the first diffraction spot for 700nm—to handle both one would need two optical filters: one for the long wavelength, one for the short. Even if we limit the range we’re interested in (say to 400nm–700nm), we’d still need a filter, since the sensor would still detect the 2nd-order 350nm spot, even though we weren’t interested in it. I showed a couple of designs for a collimator (a lens and a slit, or a pair of slits on either end of a black tube) and explained why collimation was needed for a spectrometer (none of them had included a collimator). The feedback took about the amount of time I expected, and I think I managed to communicate the problems without crushing anyone’s egos. I was careful to tell them that I was not grading them on the homework, but providing feedback for them to do better later on things that would count—particularly that other faculty would often have these expectations of them without ever articulating them. This freshman class is intended in part to help the students adapt to the college culture in a low-stakes environment. We then looked at the WP3DP3BT phototransistor data sheet together. First, I explained the mechanical drawing (dimensions in mm, the diameter sign ⌀, the two different ways that the case indicates which lead is which—both the flat and the shorter lead indicating the collector). This prompted a question about the naming of the collector and emitter (since it seemed strange to them that the collector went to the power lead and the emitter to the resistor), so I briefly explained that it was a NPN transistor, that the N’s stood for negative doping resulting in an excess of electrons as charge carriers, and that the emitter emitted the electrons and the collector collected them. I don’t know if that helped anyone. I then asked the students what they needed help understanding for the numeric part of the data sheet. We ended up talking about 5 of the 7 parameters provided, covering a lot of different things (like that nA stood for nanoamps, not “not available”—a confusion I had not anticipated). I briefly went over milli-, micro-, nano- and explained that engineers preferred using those prefixes to expressing powers of 10, so that the prefer to express the dark current as 100nA, rather than 10-7A. Some scientific calculators provide engineering notation, in which only multiples of 3 are used as the power of 10, and the numbers are between 1 and 999.999999… . I had to explain the difference between collector-to-emitter and emitter-to-collector voltages, and show the current vs. VCE curve with the two breakdowns. We talked a bit about the saturation voltage (0.8V with an irradiance of 20mW/cm2 and a current of 2mA). I’m not sure I understand that specification that well myself—it mainly tells me that we want to stay well below a 2mA current. I asked the students for their resistance values from their homework, expecting some fairly random values that would reveal different misunderstandings. What I had not expected is that most of the class had nothing—not even a guess—at the resistance. I would have expected them to ask questions on the class e-mail list if they didn’t understand, but the notion of asking each other (or a faculty member) for help still seems completely foreign to them. For Monday, 2014 Jan 27, as individuals (not groups), find a data sheet for the phototransistor WP3DP3BT. Also, select a cheap photodiode that is available in the same size and shape of package as the WP3DP3BT phototransistor and look up its data sheet. For the photodiode and the phototransistor, report the dark current, the voltage drop across the device (that would be collector-emitter saturation voltage for a phototransistor and the open-circuit voltage for a photodiode), and the sensitivity (current at 1mW/cm2 at λ=940nm, which is the wavelength where silicon photodiodes and phototransistors are most sensitive). Find a plot of the spectral sensitivity of a silicon photodiode or phototransistor (it need not be from the data sheets you found—all the silicon photodiodes and phototransistors have similar properties, unless the packaging they are in filters the light). We want to make a circuit so that the full-scale (5v) reading on the Arduino corresponds to an irradiance of 204.8μW/cm2 at 940nm, so that each of the 1024 steps corresponds to an increment of 0.2μW/cm2. Eventually someone figured out that we wanted a 5v output to correspond to 204.8μW/cm2. I asked what current that irradiance produced. Note that this is a simple linear scaling of the 0.2 nA at an irradiance of 1mW/cm2. It took several minutes for them to do this on their calculators, and several tries before the class agreed on a value (luckily the right one). Now that they had a voltage and a current, I asked them for the resistance that was needed. One student quickly mentioned Ohm’s law, and they set about doing the division. It took them a couple of minutes to do this division on their calculators, and then most of them got it wrong (getting values in the µΩ range!). Eventually they managed to converge to 122.1kΩ, after almost settling on 12.2kΩ, but what I had expected to be a 30–60-second computation for computing the resistance had taken 10–15 minutes. The arithmetic and algebra skills of college freshmen are even lower than I had feared. Class had been over officially by 10 minutes at this point (the first time I looked at my watch), so I gave each student a cuvette and asked them to look up what a colorimeter was and design one around the cuvette. By Mon 2014 Feb 3, design a colorimeter around the cuvette you picked up in class. Your design report should describe the function of the device, explain how it works, have a detailed drawing (with dimensions) of it, have a materials list of what is needed to build it, and give instructions for using it. If there are any computer components, an outline of the needed software should be included also. By Thursday night, 2014 Jan 23, e-mail your photospectrometer design to the class e-mail list, so that everyone can share the designs. For Monday, 2014 Jan 27, as individuals (not groups), find a data sheet for the phototransistor WP3DP3BT. Also, select a cheap photodiode that is available in the same size and shape of package as the WP3DP3BT phototransistor and look up its data sheet.For the photodiode and the phototransistor, report the dark current, the voltage drop across the device (that would be collector-emitter saturation voltage for a phototransistor and the open-circuit voltage for a photodiode), and the sensitivity (current at 1mW/cm2 at λ=940nm, which is the wavelength where silicon photodiodes and phototransistors are most sensitive).Find a plot of the spectral sensitivity of a silicon photodiode or phototransistor (it need not be from the data sheets you found—all the silicon photodiodes and phototransistors have similar properties, unless the packaging they are in filters the light).We want to make a circuit so that the full-scale (5v) reading on the Arduino corresponds to an irradiance of 204.8μW/cm2 at 940nm, so that each of the 1024 steps corresponds to an increment of 0.2μW/cm2. Remember that 1000μW=1mW. (We may not be able to use the full range, as the circuit should saturate at a somewhat lower value, depending on the saturation voltage or open-circuit voltage of the photodetector.) Update 2014 Feb 6: Q1 is intended to be an NPN phototransistor, not PNP as shown here! Before Monday 2014 Feb 3, get an Arduino board (I recommend Uno Rev 3, but any ATMega Arduino board should do), install Arduino software (more instructions in the Getting started guide), and start doing some of the on-line tutorials.